We at the Schoenberg Institute for Manuscript Studies have created a tool that we hope will be useful to manuscript scholars, art historians, incunabulists, and all those interested in the categories and formats of fifteenth century paper, and the impact they had on the sizes of books and works of art as we see them today. We have called this tool the Needham Calculator because it is dependent upon Paul Needham’s classification of categories of fifteenth-century paper. The dimensions of books and works on paper in the fifteenth century are normally given in millimeters. Many people are not fond of millimeters, and for good reason. They are difficult to visualize in quantity (and they are so small that they come in quantity), and the issue is exacerbated in our digital world, through which reproductions are only seen at their original size by accident. We need to be able to visualize the dimensions of a book, a print or a drawing, because this frames the conditions through which the text is read and the image seen. The simple expedient of using centimeters to one decimal place helps in this regard. But more than this, while measuring in millimeters gives the paper’s current dimensions with useful precision, these dimensions more often than not were determined by the binder of a book, or the framer of an image, in a subsequent century. We need to know – if we can find out – the original size of the item, with the implications that this would have for its use, cost, aesthetics, and connoted meanings: will its large scale impress, for example, or will it instead conjure up the poetry of the miniature? Finally, millimeters are an imposed measure that does nothing to reveal decisions made by scribes, artist, and printers, in the creation of their works. The numbers don’t tell us what options were available to them in choosing the size of their paper, nor which ones they actually chose in specific instances. We have called this table a table of flavors. In doing so we have introduced a new term into descriptive bibliography, which needs justification. A paper’s flavor is its category+format. Category+format is an immensely powerful formula that is greater than the sum of its parts, because it uniquely prescribes the dimensions of the leaf as employed by the scribe or the printer. Category alone does not do this, because it does not indicate how the paper has been folded to make leaves, and format alone does not indicate what paper category is being folded. Flavor is central to the scribal enterprise as well as to the printer’s. By noting the paper’s flavor, the cataloguer and the scholar note not only the original dimensions of the object, but also the choices and manufacturing processes of its maker. By then noting the object’s current dimensions it becomes possible to determine the extent to which the paper has been subsequently trimmed. It is astonishing that no medieval manuscript catalogues record the flavor of their paper, and no incunable catalogues do either, unless they were produced under the influence of Paul Needham at Sotheby’s and Christie’s since the Doheny sale of 1987. Perhaps bibliography is in better shape after 1500; those in the know seem to know exactly what they mean by the term “Shakespeare quarto”. We know what they mean too, as long as Shakespeare is a category of paper. It’s time to give flavor the attention and seriousness it deserves, and perhaps not just in the fifteenth century. Even though fifteenth-century paper potentially came in sixty-four different flavors, it did not come in sixty-four different sizes, because different flavors can have the same size. The Half-Median category is half the size of the Median, which in turn is half the size of the Imperial, and the Chancery category is approximately half the size of the Royal. Since the ratio of height to width in these categories is approximately the square root of 2 (lets say 1.41), when these categories are folded in half and rotated 90 degrees, they maintain the same proportion. This means that a Royal quarto is approximately the same size as a Chancery folio, and an Imperial octavo the same size as a Median quarto. This is not true of the “super” categories, as Needham has termed them, which tend to be relatively tall and thin in folio and octavo, and somewhat square in quarto and 16mo. Thus, in the fifteenth century, there are more flavors than sizes; several of the most common sizes come in two or more flavors. The size of a work on paper in the fifteenth century was, then, determined by the choices of scribes, printers, and draughtsmen: they chose paper that came in standard categories, and they manipulated it into standard formats. In the fifteenth century, for example, scribes would not choose pages for a book that were 209 millimeters tall and 148 millimeters wide. Rather they could choose Royal sheets of paper which, folded three times, would make a Royal octavo book. Alternatively, they could choose Chancery sheets which, folded twice, would make a Chancery quarto book. Both these options would result in pages that were around 21 centimeters by 15. To make a book smaller, they could trim the pages down; but they were more likely to choose a different size of paper, for example Median sheets, folded into octavo, giving them pages of around 17 centimeters by 12. Let us illustrate some of the paper flavors by looking at some manuscripts from Penn’s collection. 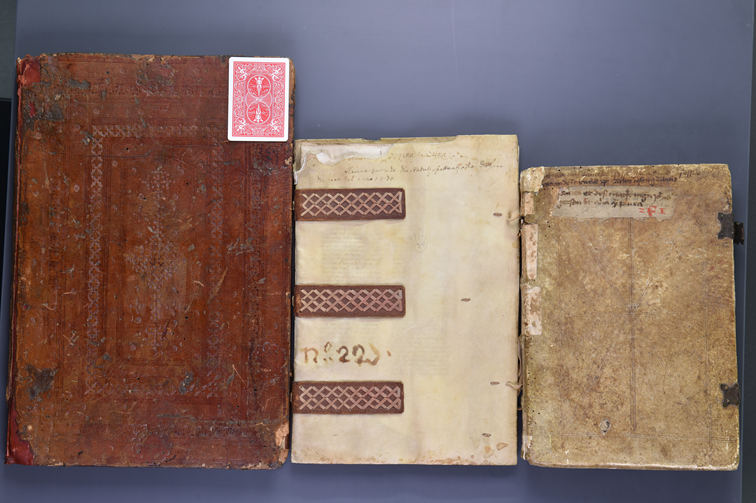 Here are three different categories of paper, all in folio format: Royal (UPenn Ms. Codex 725, 41.7×27.3cm), Median (UPenn MS. Codex 323, 33.2×23.1cm), and Chancery (UPenn Ms. Codex 96, 29.9×21.4cm). The playing card is included for scale. Here the largest book is a Chancery folio (UPenn Ms. Codex 96, 29.9×21.4cm). Beside it is a Chancery agenda quarto (UPenn Ms. Codex 1047, 28.8x11cm), created by folding folios in half lengthways. On top of it is a Chancery quarto (UPenn LJS 452, 21.8×14.2cm), created by folding folio sheets in half across the width, so that the height of the quarto is the same as the width of the folio. Lying on top of the quarto is a Chancery octavo (UPenn LJS 236, 14.7×10.4cm), created by folding quarto sheets in half across the width, so that the height of the octavo is the width of the quarto. Finally, on top of the octavo is a Chancery 16mo (UPenn Ms. Codex 715, 11×7.6cm) , created out of the octavo in the same manner. This photo shows two books, but four paper “flavors”. The book on the right is mixed format and contains both Median octavo and Half Median quarto (UPenn Ms. Codex 840, 16.7×11.7). 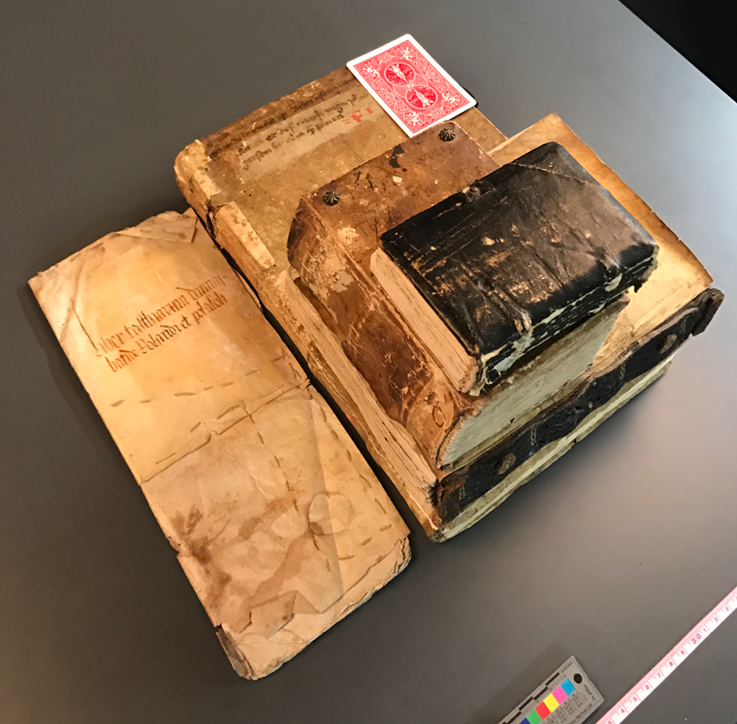 The book on the left, which is noticeably smaller, contains both Royal 16mo and Chancery octavo (UPenn Ms. Codex 313, 14.5×10.5cm). The graph has clear steps in it, because the heights of the books are clustered; some sizes, corresponding to the dimensions of standard flavors of paper, are much more common than other sizes, just larger than those flavors. This stepping effect is also seen by surveying fifteenth-century manuscripts; and so it should. Although Needham’s data is based on books post c.1455, one of the few things that Gutenberg did not have to invent for the typographic process was paper. 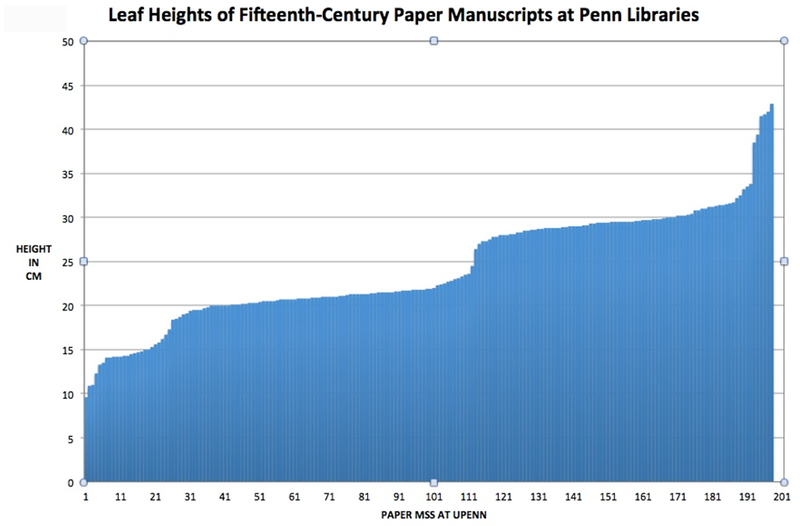 This graph shows the heights of all the fifteenth-century paper manuscripts at the Penn Libraries, which we measured. No data here conflicts with Needham’s categories. This doesn’t rule out the possibility that such data will be found in surviving paper. While the Bologna stone sizes for Reçute and Meçane fall within Needham’s categories of Chancery and Median, The Bologna Stone’s Realle is very slightly wider than Needham’s Super-Royal, and the stone’s Inperialle is 2cm taller and 4cm wider than Needham’s Imperial full sheet, but as far as we are aware, no evidence has been found for the latter’s use in the pre-incunable period. 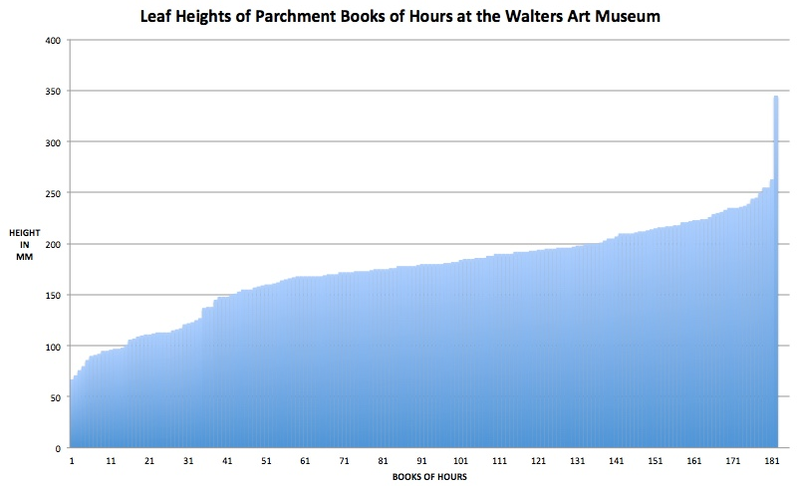 By way of contrast, the graph below is of parchment manuscripts: we measured the heights of all the books of hours at the Walters Art Museum. There is little evidence of a stepping effect in this curve, and the evidence of this small sample suggests that parchment usually did not come in categories in the fifteenth century. However, while it is clear that diagnosing the flavor of the pages of a leaf of fifteenth-century paper provides good useful information, it is also true that it is currently a non-trivial task. It can tell you much about choices made by scribes and printers, but you have to retain many ranges of unmemorable numbers, and be alert at all times to the various possible flavors. Is it worth the time when you could actually be reading the book or studying the image? Well, that depends who you are. It’s worth our time: Will Noel is in meetings all day, and George Gordon is stuck behind the supervisor’s desk in the reading room. But is it worth your time? Rather than seek further to convince you of the value of the information, we now seek to reduce the amount of time and expertise it takes to make the calculation. In order to achieve diagnosis of fifteenth-century books at scale, we need to make it an automated task based upon a very few attributes of paper. And so George Gordon built this tool with three inputs. The first is the current dimensions of the leaf, in centimeters, to one decimal place. The second is the orientation of the impression of chain lines from the paper mould on the paper itself. In books and in portrait single sheets they will be vertical in folio, agenda quarto, octavo, and (the very rare) 32mo; they will be horizontal in full sheet, quarto, 16mo, and (the very rare) 64mo; in landscape single sheets these orientations are reversed. The third is the presence of deckle on the edge of the paper. In the paper making process, slurry would necessarily seep between the mold and the deckle frame, resulting in a uneven edge to the paper. 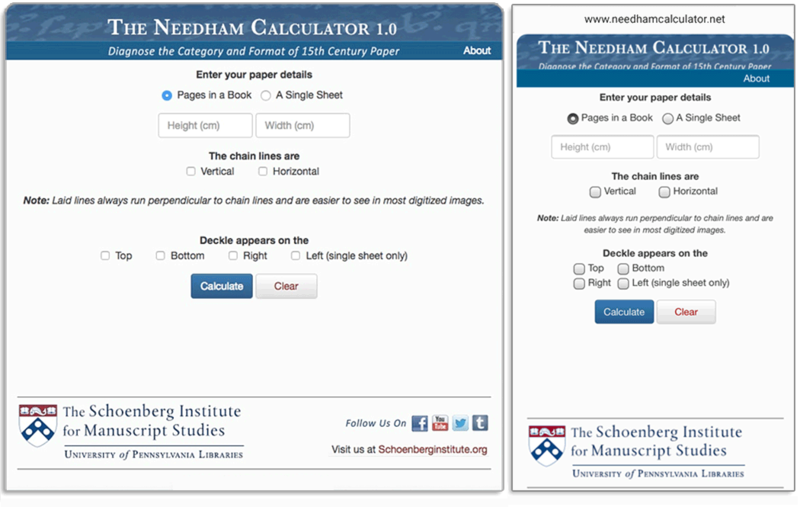 The Needham Calculator as it appears on the desktop, and on the mobile. The machine assigns maximum possible dimensions for each category of paper. It then creates maximums for each flavor by dividing in half and switching height and width to simulate the folding and rotation used to create the physical object. When the user submits height and width information the machine checks for all flavor combinations whose dimensions are greater or equal to the dimensions given. If information about the chain lines is entered, half the flavors will be skipped automatically based on their format. When no deckle information is given, the candidates accepted by the above process are sorted by surface area and the two or three smallest are listed in the result. The process is more complicated when deckle information is given. Since deckle constitutes the untrimmed edge of a piece of paper, it implies that the corresponding dimension approximates the maximum height or width for some flavor, though it may be slightly smaller because not all sheets of a given category are in fact identical in size. The machine handles this by sorting candidates by size in the relevant dimension, and listing either the shortest or the narrowest flavor candidate. It only gives a second option if there is a tie in a given dimension. A single flavor is also the result when there is enough deckle information to rule out alternative candidates that are larger in either dimension. Press CALCULATE and the machine does the work for you. It gives the smallest possible flavors of paper based upon the evidence that has been entered. If, for example, you have a book whose pages are 31cm by 22cm, with vertical chain lines, it will tell you that the smallest available diagnosis is Chancery folio. It will also tell you larger sizes that the paper might have been – the taller Super-Chancery, or the taller and wider Median. This is where the deckle becomes important. Note the appearance of deckle on the sides, at 22cm, and you have ruled out the possibility of Median; note the appearance of deckle at the top at 31cm, and you have ruled out any possibility but Chancery folio. When watermarks appear they can be useful as corroborative evidence for format, but for the purpose of diagnosing the category and format of your paper they are not usually necessary. In folio, they appear in the center of a page; in quarto at the center of the gutter; in octavo in the top left corner, and in 16mo, at the top right corner. In nearly all cases however, they are surplus to requirements. This is lucky, since in digital images watermarks are often impossible to see. Only in distinguishing Half-Median folio from Imperial octavo, Half-Median quarto from Imperial 16mo, Half-Median octavo from Imperial 32mo, and Half-Median 16mo from Imperial 64mo are they always necessary, as the sizes of these flavors and the orientation of their chain lines are indeed similar. The machine prompts you to inspect the watermarks, and tells you where to look for them, if you get such a result. This version of the Needham Calculator is limited to the flavor of pages. It says nothing of itself about the composition of gatherings. One detail we do point out however is that if deckle is seen on the top as well as the bottom of all formats smaller than folio, this indicates that the book can only have been written/printed on half sheets. A good example is UPenn Ms. Codex 106, a Chancery quarto. This is the case for books, but archivists and art historians often deal with single sheets. The Needham Calculator also caters for single sheets, for all categories of paper, and in half sheets, quarter sheets, eighth sheets sixteenth sheets and so on, and it also automatically tells you whether your sheet is in landscape or portrait orientation. The limitation of the calculator is obvious: paper can be so cut down that its dimensions now match those of a smaller flavor with chain lines in a similar orientation. This is not as much of a problem for students of fifteenth century printed items as it is to those of manuscripts and drawings, because even though individual copies now have different sizes, they were originally printed on the same category of paper. If they look for the tallest surviving copy of an edition, they will have very close to the original dimensions of the paper for the edition, and can then establish its category and format. For example, the machine identifies Penn Libraries’ copy of Goff N-58 (Nicolaus de Ausmo, Summa Pisanellae. Venice: Barthelomaeus Cremonensis, 30 Nov. 1473) as Half-Median folio or Imperial octavo. But we know from other copies that it is a Chancery folio, and a book that originally had very wide margins. However, since each manuscript is unique, even though its paper is not, manuscript scholars do not have recourse to this procedure. This is why the Needham Calculator doesn’t actually tell you unequivocally the flavor of your paper, unless you have the evidence of deckle to establish the maximum dimensions of the sheet. Rather, it tells you the smallest viable flavor, and also gives you the next smallest possibility. But how often does it happen that a book is so trimmed that it has the dimensions of a smaller flavor? 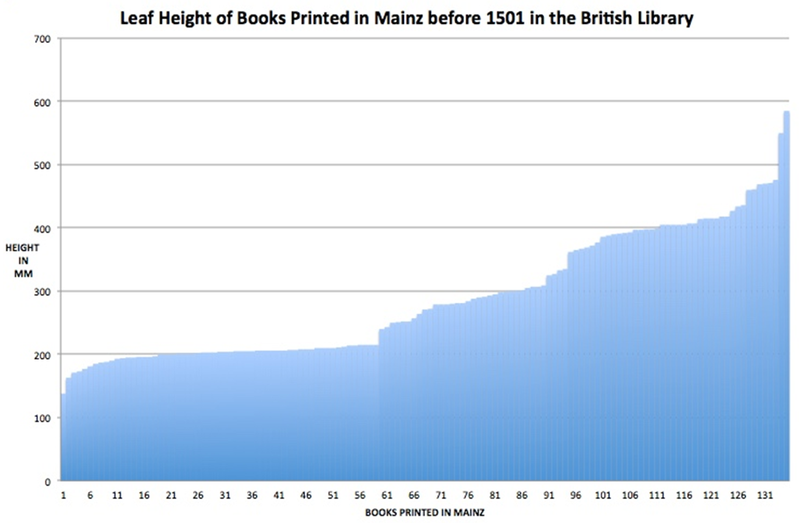 One way to check is by comparing its results with those in a catalogue of printed books in which paper flavor has been determined not by the dimensions of the catalogued book, but by the tallest known copy of the edition to which it belongs. One such is the catalogue of the sale of the Incunabula from the Court Library at Donaueschingen, Sotheby’s, London, July 1, 1994. Of the 326 lots here, the flavors of several of which have since been reconsidered by Needham, the machine identified the paper flavor correctly all but 26 times; 21 of these times the correct size was the machine’s second choice; and four times it was the machine’s third choice. Manuscript people will never have the luxury that printed book people have of finding the tallest copy; for us, absent deckle, guessing the category of our paper will always be a percentage game. 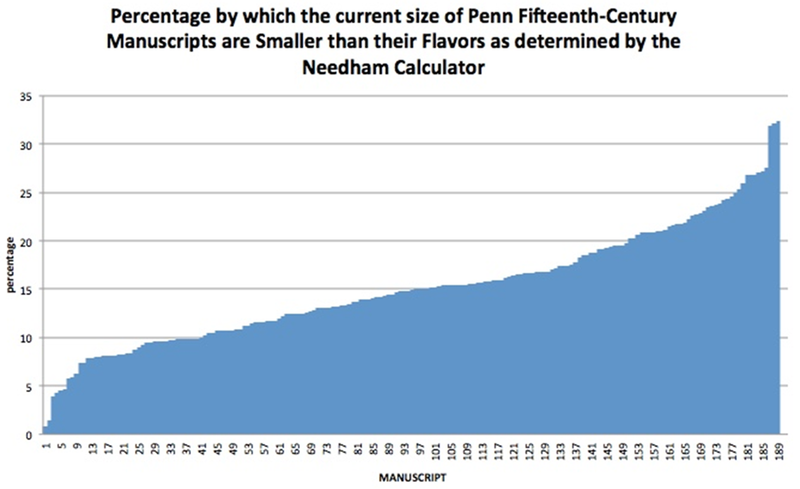 An analysis of Penn’s paper manuscripts indicates that their leaves are now on average 15% less in area than the area of their paper flavor as indicated by the Needham Calculator. In fact the real figure will be slightly higher, as the calculator will sometimes select a smaller category than was in fact the case, and never select a larger one. Nonetheless since an Imperial sheet is 22.8% larger than a Royal sheet by area, a Royal sheet 30.5% larger than a Median sheet, a Median 17.2% larger than a Chancery, and a Chancery 40% larger than a Half-Median, we can be reasonably confident of distinguishing these from each other. It even has to be a pretty well cut-down Median for the Machine to confuse it with a Chancery. This is especially the case since to fool the machine your paper needs to be less than the dimensions in both the height and the width of a smaller category. The problem lies, again deckle being absent, in distinguishing the “Super” categories from the normal ones. 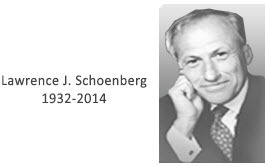 A Super-Chancery is only 4.5% larger than a Chancery, and they only differ in height. Moreover, a Super-Chancery is only 13.3% smaller than a Median. A folio leaf with a height of 31.2cm with a width of 22.5cm, therefore, which doesn’t have any deckle, is the hardest leaf to diagnose, with or without the calculator, and we are working on a version 2.0 that we hope will help address this problem. The current calculator doesn’t lie and will give you your options, but the second choice or even third choice it gives you may occasionally be as likely as the first. There you are. You no longer have to be Paul Needham to diagnose the flavor of the paper of your print, drawing, or book – manuscript or printed – in the fifteenth century. Moreover, with the help of The Needham Calculator, this can now be done so quickly that we believe it is worth the time of most scholars, catalogers, and collectors to record the flavor as well as the dimensions of their works on paper. God Bless You. This is the most useful tool since the first sharpened flint. Or do I mean the first berry-juice-soaked reed? This is very, very cool. But what is agenda quarto? Agenda quarto: a quarto where the second fold is parallel to the first, creating a long, narrow book, as you can see on the picture. 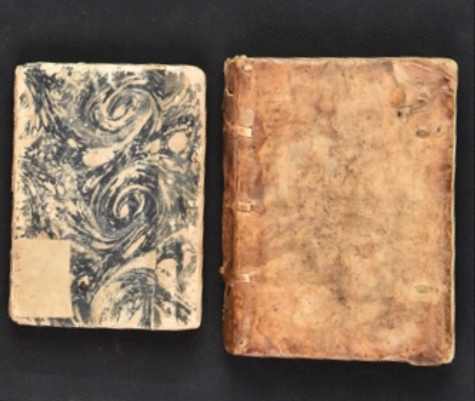 Rare for printed books, but relatively common in archives: ledgers, notebooks and agendas.